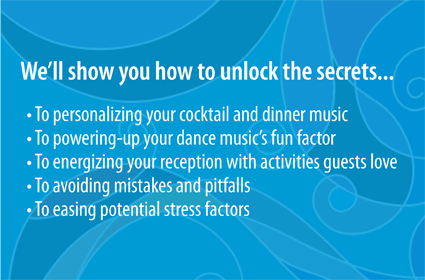 Discover everything you need to make your reception carefree and fun with our interactive, comprehensive 8 Step Planning Program. With Wedding Reception Perfection as your personal consultant, you'll create your own customized music, announcement and activity plan with on-line ease. A successful reception starts with a great plan. See how much is waiting for you. Sample each of the program's eight steps. See how they will help you craft a customized reception plan. Maximize your reception's "fun factor" to match your style and taste. Try Wedding Reception Perfection for FREE! See what all the excitement is about. Create your own Wedding Reception Perfection masterpiece. It's GUARANTEED! © Wedding Reception Perfection, Inc.